During October's Mornings with Mayesh, Yvonne, Shelley, and Dave cover some great florist generated questions. They started the morning with Shelley and Dave talking about some of the beautiful fall flowers that are currently available. Afterward, they answered some audience questions that range from flower schools, cake flowers, wire services, increasing your marketing ROI & more. Enjoy and be sure to mark your calendars for November 20th to catch the next show. Also, don't forget to comment with your new questions! From IG: What are some great fall flowers available now? So many to choose from, lets do these in show & tell? From IG: When do Christmas greens arrive? We already have some Christmas greens available and are taking pre-books now... hint, hint! We have Port Orford cedar, Douglas & Noble fir & Mixed boxes in stock and If you need to do your Christmas photo shoots & mockups, give us a call and we can bring more in for you. From Huntress Florals: Can you give recommendations for great floral schools? I've taken courses at the market with American School of Floral Design, and with Shelly, as well as Phil Rulloda up in OC. I'm interested in credible International programs as well! I found this great download on SAF’s website that lists all of the floriculture schools in the US. But how do you know which ones are the best? Well, this kind of question is tough to answer because it is subjective. I think it all depends on what you want to learn and how you like to learn. That is when Facebook pages, groups, and Google reviews come in handy. Based on a few FB groups, it seems that Floral Design Institute and Floriology Institute, stand out for having high-quality programs. Dave: Most states have florists associations with extended learning programs but I would check local community colleges for classes. I found a bunch by googling local floral design schools, some accredited and others informal. Shelley: This industry is a tough one for training, I find taking some basic classes at an adult continuing education classes are helpful. I know we have a couple of schools we work with here. Texas A&M University has a great floral program and you can get a degree in floriculture. But even having proper training and a degree will not always guarantee you a job or work. Most florists I have worked out really want to see how many years experience you have under your belt. Really nothing beats interning and learning hands-on as you go with more experienced floral designers. This takes many years and doesn’t happen overnight. IG: How do you place flowers on a cake safely? Shelley: This seems to get folks fired up a bit because of pesticides. And yes, it is a valid concern but in all my years of decorating cakes, I never treated the flowers with anything special. Just made sure they were clean and prepped. It is almost impossible to arrange on a cake and not have the flowers touch the icing. I know people who like to lay wax paper down or use a special oasis holder. There are little plastic holders but then they make decorating the cake awkward. 95% on the couples I have worked with have never expressed concern about the flowers being on their cakes. I have decorated hundreds and the couple’s who are concerned will usually ask for organic flowers or herbs or a design that is around the cake not on it. Because there are more local and organic growers these days the option of organic pesticide-free flowers should be a little easier to come by, but it is not always possible. Most caterers will cut away the decorated part anyway because the slices are not aesthetically pleasing or the couple uses the bridal cake as a showpiece only and then a separate sheet cake is sliced and served. I have never had or even heard of anyone getting sick from eating flowers on a cake. You are not consuming the flowers after all. If you are an eco-friendly florist try suggesting fresh herbs or locally grown flowers if you bride seems concerned. Hydroponically grown flowers could make a better choice for cake flowers as well. IG: What are the best wire services? Again, I freaking love social sites like Facebook because you can learn so much from others. Florists of Facebook group had 78 comments to a similar question. If you go through everyone’s opinion the main theme is that you shouldn’t use a wire service. Wire services came to be because for Google, people would go to their local florist to order flowers for someone that not local. Wire services provided a way to get those orders filled and also a way to get the payment squared away. Today, many people will just jump on the internet and find a florist in the area of the person they are ordering flowers for. It is so much easier. the comments on this article are really great so be sure to read all the way to the end. However, I did see a few advocate that wire services can be beneficial for newer retail shops depending on your demographics. You just need to be sure to do your due diligence and crunch those number to make sure it is a good fit for you. A side comment is that others mentioned Bloomnation. They are NOT a wire service. I like to think of them like an Etsy for flowers that can also help provide things like a website and POS. Shelley: Yes, I am completely in agreement that a wire service is not necessary and can cost a florist thousands of dollars in fees. BBrooks and Bloom Nation are great alternatives. I have belonged to both. BBrooks if you not familiar with is a community of upscale and niche florists and you must be asked or invited to join or you can submit your work for approval and be juried in. They are more exclusive in nature, so that the types of florists they are recommending are all consistently high quality and elegant. While this may sound a little snobbish it does give you a great database of tried and true upscale shops to choose from. I was on the pilot program with Bloom Nation and they essentially were trying to do the same thing but I think they have found it more profitable to have a more general base of florists. Bloom Nation pays you right away for an order less 20% Bbrooks sends you a monthly bill and the fees are very affordable. IG: How to get re-orders? How do you get someone who ordered flowers online to order again? Shelley: Provide excellent customer service and do an outstanding job on their order! Really, I am all about customer service...don’t just be an order taker. Things, like taking a picture of your design and sending it after the delivery, was made, a special thank you note, a small coupon off their next order or waive the delivery charge are some customer incentives. Once a customer finds a great florist they will usually come right back for future orders. It’s a lot like finding the perfect hair stylist...not always easy for people. Just know that not all customers send flowers monthly..it’s more like once or twice a year. I would invite them to your shop or host an open house to get them in the door as well. Yvonne: Make sure you are collecting some information about your customers that will allow you to market to them. Name, phone number, email addresses are important, but make sure you take note of special dates and personal tastes so that you can have better conversations with them via phone/text, email, direct mail, etc. In addition, I've seen florists offer subscription services. So if someone is buying flowers for their partner's birthday, what a great opportunity to upsell to make them look like superheroes and for you to have guaranteed sales throughout the year. IG: How do I get more clients from my marketing efforts? I’m a true believer in inbound marketing!! At the very high level, you need to make sure you are creating content that allows people to fall in love with you before they even meet you. You want to fill your sales funnel and push them through that funnel. You need to ensure that your marketing has strong CTA’s (calls-to-action). What do you want them to do, where do you want them to go to get more information, etc. and then ask them to do that. Have a top-notch website that is user-friendly and provides value to your potential customers and customers. Make sure you have somewhere for them to go on your website to connect with you, subscribe to you, get more information from you, etc. Then make sure you collect their information - name, email, etc. After your contacts trust you enough with some of their information, be sure you nurture that relationship by offering more valuable content and stay in touch with them via email. Be sure to occasionally ask for the sale. “Are you ready to order your flowers? Awesome, you can do so here” and send them to your site to order your flowers. This will get you not just more clients, but more of the right kind of clients so that you can spend your extremely valuable time with the right people. 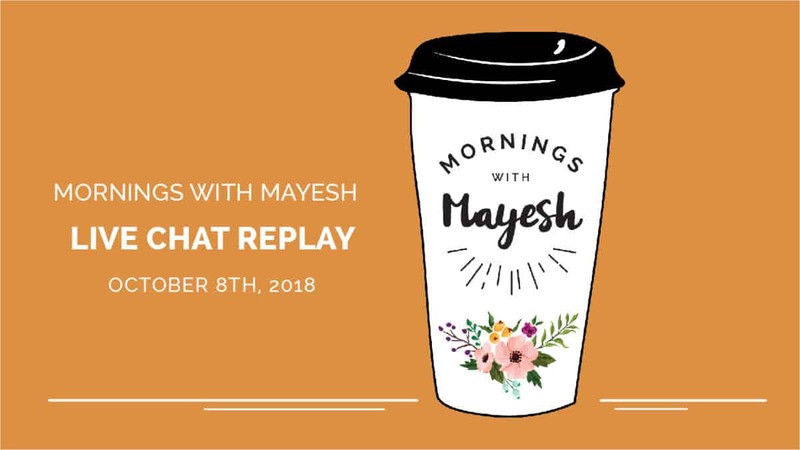 Love Mornings with Mayesh? Leave a comment letting us know what you enjoyed most! Also, don't forget to post your questions for next month's show. See you soon!